Of course this rally exposed more on the govt side………. the hilarious ways the govt and police tried to block the rally is good enough evidence on the real face of the yahapalanaya. Am sure this stupid behavior converted millions to sympathize with the JO camp. Just look at the video how the IGP behaved and said he is bending law shamelessly. The IGP sure has a lot more freedom now than earlier. Everyone is speaking up. You have been generous about the Padha Yatra. UNP Sagala said it was all crooks in the procession. And his boss Batalanada Ranil announced that Singapore Mahendran is his special adviser on finance now . Another dude from the UNP , can’t remember his name said there were only 1600 in total in the procession.. May be it was that agitated UNP IGP who did the counting. Because he threatened the Padha Yatra that he will beat the crap out of them . on stage in public to a Yahapalana gathering in Galle. Marvellous, Isn’t it to see such a dedicated IGP from the Yahapalana UNP. Now this NGO boss says it was good for the Government.. How cool.. But Batalanada Ranil apparently is is not that relaxed. Now he wants to appoint a Royal Commission to find out who broke up Asgiriya from the Malwatta Chapter. Did Batalanada form an alliance between the two too, the same way his UNP London did the Alliance among the UNP, Tiger Diaspora , TNA and Bodhi Sira?.. So this march is a ludicrous attempt to cover up for impending arrests and trials for corruption. People wanted revenge and wanted to lock people up. But what Ranil and My3 did was smart. They wanted due process and real investigations into financial crimes. That is why Ranil said the FCID needs to be 200% sure before they take action. The culture of servility by courts, judges and lawyers will take a long time to eradicate. So let us all be patient. When we find out how the Rajapakse family made off like Bandits robbing people with their commissions, Pada Yatra will stutter and fizzle and die out. MR is afraid of this. Namal Baba is afraid of this. Basil Baappa is afraid of this. As for Police IGP he is a typical sycophantic village idiot. But then again they were all yes men under Gota baappa too. The murders of Lasantha and attack on Keith will NEVER be investigated; or it will be delayed because the main culprit is a cabinet minister. Jehan brother is getting jittery he is happy Sira has given the betrothal the five year card. Sadly thought Sira does not lead the SLFP he should grab the UNP from Ranil if he wants to get re-elected because after the local elections early January 2017 all of Sira’s bootlikers will jump ship. If the Pada Yathra is a sham my worry is Jehan’s cash flow projection for the next five years will be what Ranil gave the IMF. God Bless you mate. “Sadly thought Sira does not lead the SLFP”- I think you mean ‘control’ (although even that’s up for debate). 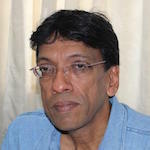 Sirisena is the chairman of the party. Whether they make sense or not Jehan has to write this kind of things to please his pay masters. Green Backs speak a lot!